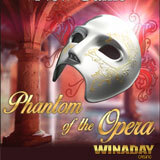 WinADay Casino unveiled its romantic new Phantom of the Opera slot game today. Get a $15 freebie to try it this weekend! Beginning Friday, if you've made at least one deposit you're eligible for a $15 Freebie to try the new game. Based on one of the greatest love stories ever told, the new 5x4, 30 payline slot has a choice of generous bonus features and a wide betting range to appeal to all kinds of players. Inspired by Andrew Lloyd Webber’s spellbinding musical, the Phantom of the Opera slot game takes us on a romantic journey backstage at the Paris Opera House. Unique online casino now accepts Litecoins cryptocurrency. The Phantom of the Opera slot has 30 fixed paylines. You can wager from just three cents per spin up to the max bet of 1500 coins ($15). Three or more of the Free Spin scatter symbols trigger a choice of three bonus games, some awarding maximum free spins and others with fewer free spins but bigger win multipliers. With four rather than the typical three rows on its reels, the Phantom of the Opera slot has more opportunities for winning combinations than most online slot games. Wagering requirement: 25X; max cashout 7X. The casino is also adding a popular new cryptocurrency option this week: Litecoin. Last summer, WinADay added Bitcoins to its options for deposits and withdrawals. The unique casino now offers another cryptocurrency option: Litecoins. Like Bitcoins, Litecoins are an easy and secure way to make deposits and collect winnings but transactions are even faster and with vastly reduced fees. Litecoins can be purchased through most major cryptocurrency exchanges including Okex and Kraken. 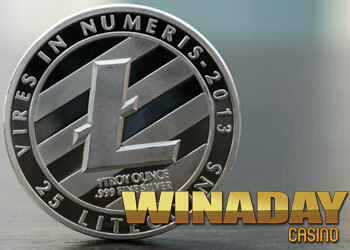 For further information see Winaday’s Litecoin Guide. May be claimed twice per day. Litecoin deposits only. Wagering requirement: 27X.